1/2 Ounce South African Krugerrand gold coin. The 1/2 ounce Krugerrand gold coin is produced by the Rand Refinery in South Africa. Today, the coin is one of the most popular gold coins among investors world-wide. The slight copperish tone of the Kruguerrand coin is due to the addition of copper alloy to the coin, which makes it more durable. 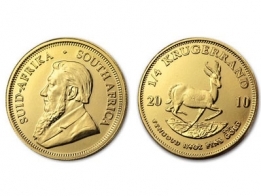 The Krugerrand series is sold in 1/10 Ounce, 1/4 Ounce, 1/2 Ounce and 1 Ounce sizes. In 2017 the Rand Refinery also introduced a one ounce silver Krugerrand and a one ounce platinum Krugerrand coin. 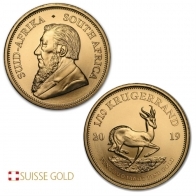 The Krugerrand series of gold coins is one of the most popular gold coins available in the precious metals market to individuals looking to buy gold coins. The gold Krugerrand carries a low premium and is one of the most recognised gold coins available worldwide. 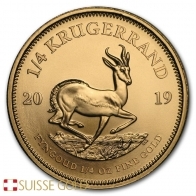 SuisseGold.ch also buys gold Krugerrands from investors looking to sell gold Krugerrands. Please click here for further information. To view the gold price today, please click here.